This article is about the television series. For other uses, see Give Me a Break (disambiguation). Gimme a Break! is an American sitcom that aired on NBC for six seasons from October 29, 1981 until May 12, 1987. The series starred Nell Carter as the housekeeper for a widowed police chief (Dolph Sweet) and his three daughters. The sitcom takes place in Glenlawn, a fictional suburb, located in either central or northern California. Nellie Ruth "Nell" Harper (Nell Carter) agrees to look after the Kanisky household as a special favor to her dying friend Margaret Huffman Kanisky (played in flashback by Sharon Spelman), who was the wife of police chief Carl Kanisky (Dolph Sweet), serving as a parental figure to the Chief's three teenage daughters, Katie (Kari Michaelsen), Julie (Lauri Hendler), and Samantha (Lara Jill Miller). A foster son, Joey (Joey Lawrence), was added to the Kanisky household in Season 3. Five episodes into the sixth and final season, the show changed locales from Glenlawn to New York City, when Nell, concerned for Joey's welfare after he moved there with his absentee father, traveled there to check on him. She subsequently assumed guardianship of Joey and his younger brother Matthew (played by Joey Lawrence's real-life brother Matthew Lawrence) at their father's request and was forced to permanently relocate there after Chief Kanisky's father Stanley (John Hoyt) sold the family's Glenlawn home. Over the six-year run, a number of celebrities appeared on the show, including singers Whitney Houston, Andy Gibb, Sammy Davis, Jr., Ray Parker Jr., and The Pointer Sisters. More often than not, the guest singers would perform a song with Nell on the episodes. During the third season, Pat Sajak guest-starred as himself when Nell and her friend Addy (Telma Hopkins) were contestants on Wheel of Fortune. Other notable guest stars included Milton Berle, Danny Glover, Rue McClanahan, Tony Randall, Helen Hunt, Don Rickles, Gwen Verdon, Dennis Haysbert, Ernie Hudson, Gary Collins, and Elizabeth Berkley. The episode "Cat Story" was performed and broadcast live on March 2, 1985, as a promotional gimmick, which the cast performed without major incident. An earlier episode (from the 1984–85 season), "Baby of the Family," ranked No. 38 on TV Land's list of "The 100 Most Unexpected TV Moments;" it depicted Joey dressing and performing in blackface at Nell's church benefit, a plan hatched by Samantha to retaliate for Nell forbidding her to go on an unchaperoned camping trip. The location of Glenlawn is never fully clarified, and various contradictory location information is presented during the series. Seaons 3 episode "James Returns" states that Glenlawn is "over 300 miles" from Santa Barbara, and "The Mayor", an episode from the same season, shows the chief boasting that a new police car could make it to Sacramento in 23 minutes. These would place Glenlawn somewhere near Stockton. However, another episode from Season 3, "Flashback", placed the town an hour away from Fresno, in the direction of Bakersfield. In another episode where exterior shooting took place, GlenLawn is on the ocean with palm trees. The proximity to the Bay Area is supported by later season episodes where Katie moves to San Francisco and Julie moves to nearby San Jose. Nell Carter as Nellie Ruth "Nell" Harper. Nell was a singer from Tuscaloosa County, Alabama who ran away from home when she was 18. She met and became friends with Margaret Kanisky and promised to look after her family after she had died from cancer. In keeping her promise, Nell took on the role of housekeeper and mother to the kids and remained in the series for the entire 6-year run. She later became a foster mother to Joey Donovan in Season 3. Nell moved to Greenwich Village in New York City in Season 6 with Joey and Addy and worked as an assistant editor for a publishing company. Dolph Sweet as Police Chief Carl "Chief" Kanisky (Seasons 1–4). Police Chief Carl Kanisky, known simply as "the Chief," was a widower with three teenage daughters. After Dolph Sweet's death on May 8, 1985, his character of the Chief was written out of the series as also having died, and the show continued with Nell taking over as head of the household. Kari Michaelsen as Kathleen "Katie" Kanisky (Seasons 1–5). The Chief's eldest daughter, portrayed as a typical "blonde" and being promiscuous. She decided not to go to college and opened a boutique called Katie's Korner. After her boutique went out of business, she was written out of the series as having obtained a job in San Francisco. Her last appearance was the first episode of Season 6. Lauri Hendler as Julie Kanisky Maxwell (Seasons 1–5). The Chief's middle daughter, portrayed as being very intelligent. She married Jonathan Maxwell at the end of Season 4 and became pregnant in Season 5. In the Season 6 premiere, after Nell Maxwell had been born, the new three-member Maxwell family moved to San Jose and was therefore written out of the series. Lara Jill Miller as Samantha "Sam" Kanisky (Seasons 1–5, recurring in season 6). The Chief's youngest daughter, portrayed as a typical tomboy in her preteen years but developed into a boy-crazy teenager. She moved to Warren County, New Jersey to go to Littlefield College and had a recurring role in Season 6. John Hoyt as Stanley "Grandpa" Kanisky (Seasons 2–6, previously recurring). The Chief's crusty but lovable Polish immigrant father. After his wife died, Grandpa Kanisky came to live with his son and granddaughters in Season 3. In Season 6 he moved to New York City, into the same building as Nell. Joey Lawrence as Joey Donovan (Seasons 3–6), who eventually became Nell's foster son; before that he had been working as a con artist to raise money to join his uncle in Chicago. Later Joey became a key cast member. His father Tim Donovan appeared on the show in New Orleans and in New York City. Joey met his little brother and moved in with Tim at the beginning of season 6 but soon afterwards was reunited with Nell and lived with her and Addy in New York City. Howard Morton as Officer Ralph Waldo Simpson (Seasons 3–5, previously recurring). A not very bright but lovable police officer who was a subordinate of the Chief's. Telma Hopkins as Dr. Adelaide "Addy" Wilson (Seasons 4–6, previously recurring). Nell's childhood friend, Ph.D. and a Phi Beta Kappa, Addy was chief educational curriculum supervisor for postgraduate students who are studying for Doctorates in history, English and economic geography under the California university system and later moved to New York City; Nell eventually joined her there. Although Nell and Addy were friends, they were also constantly clashing. Jonathan Silverman as Jonathan Maxwell (Season 5, previously recurring). Julie's husband, pizza-delivery man and archeology student. Jonathan went to Mexico on a three-month dig. Jonathan, Julie, and their new baby left for San Jose after Season 5. Rosetta LeNoire as Maybelle "Mama Maybelle" Harper (Season 6, previously recurring). Nell's stern, bitter and critical mother who was introduced in Season 4 ("Alabamy Bound: Part 1"). Previously, in Seasons 1 ("Nell Goes Home") and 3 ("A Kanisky Christmas"), the character's name was Emma, was played by Hilda Haynes and was soft-spoken. Matthew Lawrence as Matthew Donovan (Season 6), Joey's little brother and Nell's foster son. Rosie O'Donnell as Maggie O'Brien (Season 6), Nell's dental hygienist neighbor in New York City. Paul Sand as Marty (Season 6), The landlord of the building Nell, Addy, Joey, and Matthew lived in. He also owned the adjacent restaurant La Gazpacho, where he went by "Esteban." Alvernette Jimenez as Angie McDaniel. Nell's tall, skinny, and dim-witted friend, the typical airhead with a little girl's voice. The character was eventually written out of the show, but appeared in several episodes between seasons 1 and 4. Jane Dulo as Mildred Kanisky (née Wuchetzky). Stanley Kanisky's wife and Carl's mother. Also played by Elvia Allman in "Katie the Cheat" and Elizabeth Kerr in "Grandma Fools Around." Dulo played the role in season 2. The character died, leaving Stanley a widower in Season 3. Pete Schrum as Ed Kanisky, Carl's brother, an overweight mortician who loved to play practical jokes. Ed was a recurring character in Seasons 1 and 2, then got married and was written out of the series. Patrick Collins as Tim Donovan. Joey and Matthew's father was a merchant seaman. Joey reunited with Tim in New Orleans in season 4 (when Tim was played by Fred McCarren). Joey went to live with Tim and Matthew in the beginning of season 6 when Tim decided to get a job in New York City. After realizing he couldn't handle a 9-to-5 job, Tim decided he wanted to go back to sea and Joey returned to Nell and Addy along with Matthew. Jack Fletcher as Erwin J. Swackhammer. During the 1982–83 season, the family contended with this man who would annoy the Kanisky household in various ways, the most notable of which occurred when he was the manager of the telephone company and had Nell arrested and jailed. After 5 episodes, Swackhammer disappeared with no explanation. Harrison Page as Hamilton Storm. A news reporter that appeared occasionally during Seasons 1 and 2 who appeared more concerned with his appearance than giving the news. The show was produced by Alan Landsburg Productions (renamed as Reeves Entertainment Group in 1985). The American syndication rights are held by NBCUniversal Television Distribution, the successor company to original syndicator MCA TV. FremantleMedia owns the international rights, as they own Thames Television, which acquired Reeves Entertainment Group in 1990. The creators of the show were Mort Lachman and Sy Rosen. Over its run, the series used two different theme songs. The first was composed by Bob Christianson with lyrics by Bob Garrett and Marley Sims; two versions of this song were used, one for the first season and a new recording for the second. A new theme, with music by Jay Graydon and lyrics by Richard Page, was introduced in the third season and used for the remainder of the show's run. The new theme has similarities to the first but with a more positive attitude. Carter performed both themes. The show has been in syndication since 1985. Reruns have also aired nationally on WWOR EMI Service and USA. Distribution rights are jointly owned by The Program Exchange and NBCUniversal Television Distribution, successor in interest to previous syndicator MCA Television. Reruns of the series are a mainstay of many of Sinclair Broadcast Group's The CW and MyNetworkTV stations, especially in low-traffic time periods, due to the low-cost barter setup of The Program Exchange. Antenna TV has aired the show since January 2, 2018. Universal Studios Home Entertainment released a three-disc DVD of the complete first season of Gimme a Break! on February 14, 2006, available in the United States only. The Complete Series is now available in the US. 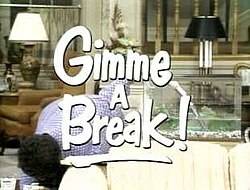 Visual Entertainment (under license from FremantleMedia) released the first two seasons of Gimme a Break! on DVD in Canada between 2006–07. In 2009, VEI announced that they plan on releasing the entire series in a complete series box set in 2010. VEI released Gimme a Break! The Complete Series on DVD in Canada on July 20, 2010. As of 2013, these releases have been discontinued and are out of print. Simply Media TV Ltd released the first and second series in the UK, although the series has never been broadcast on British television. Nell Carter received two Emmy nominations as Best Actress in a Comedy Series (1982, 1983) and two Golden Globe nominations as Best Actress in a Television Series-Comedy or Musical (1983, 1985). ^ PRNewswire, "TV Guide and TV Land Join Forces To Count Down The 100 Most Unexpected TV Moments", December 1, 2005. Accessed March 23, 2009. ^ Lambert, David (2009-10-02). "Gimme a Break! – A Fan Inquiry to Us on Facebook Leads to Some VERY Interesting New Information!". tvshowsondvd.com. Archived from the original on 24 November 2009. Retrieved 5 December 2009. ^ "Gimme a Break! DVD news: Announcement for Gimme a Break! - The Complete Series - TVShowsOnDVD.com". www.tvshowsondvd.com. Archived from the original on 2010-05-21. ^ "Nell Carter – Television Academy".